LITTLE ROCK, AR: The Feline Finders – Lisa Willems, (501) 993-1999, www.thefelinefinders.com, e-mail: lisa@thefelinefinders.com. Lisa is a certified MAR Technician who specializes in finding lost cats. 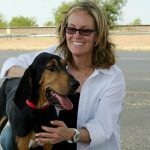 Lisa offers phone consultations, on-site searches with her search dogs, and is willing to fly or drive to work searches throughout the USA. Service Area: Located in Arkansas but will travel to nearby states. I will co consultations anywhere in the US. Availability: Available on request and on most weekends.